I apologise for taking the easy way out today. I usually go to great lengths to provide a striking photo or image to illuminate my posts. However, I had a big day yesterday so I’m just making do. Living only 700 metres from the beach, you’d think that I could just hit the beach and draw a real line in the sand to get a great image for my blog. After all, the beach is so beautiful. It’s hardly an effort! 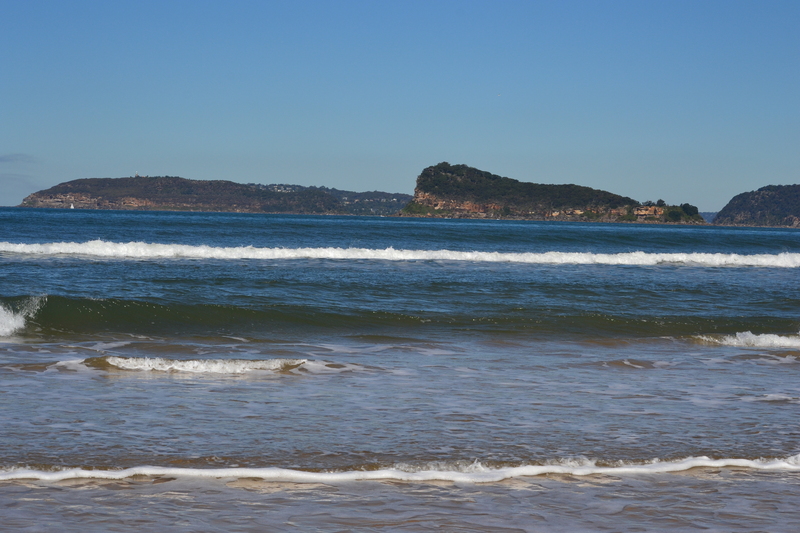 Our beach has stunning views across to Palm Beach and Pittwater with the beautiful Lion Island majestically rising from the surf. Surely, going to the beach isn’t a chore?!! I even have a few ideas about how I could draw my line in the sand if only I could get down there. I’m thinking driftwood. Driftwood sounds so poetic. I can’t help wondering how far that precious lump of wood has travelled or where it’s come from. Of course, I’m assuming that it has come from somewhere really exotic. It’s journeyed thousands of kilometres enduring sun, rain and storms to get here. I can see it now… that small piece of wood bobbing up and down being tossed by the waves as it traversed the vast expanse of the Pacific Ocean. It’s travelled all the way to Australia from one of the Pacific islands like Vanuatu or the Solomon Islands. Or maybe, it’s from South America or even deepest, darkest Peru. That sounds even more exotic. However, given the direction of the ocean currents, it would have needed a good outboard motor to get here! It would be drifting against the flow. In all likelihood, however, my precious piece of driftwood probably comes from Woy Woy and hasn’t travelled far at all. It’s just a scraggly piece of eucalypt and doesn’t have much of a story to tell. Gum trees might be exciting if you’re a koala bear or you’re not from around here but for me, they’re “common”. Getting back to photographing my line in the sand, I could also be very pragmatic and just draw a line in the sand with my finger or photograph a tidal mark where the ocean has etched its own line in the sand. As I said, it wouldn’t take long and it wouldn’t take much effort for me to just jump in the car and take a few photos. I wouldn’t even need to walk. However, today I’m recovering from a hectic trip to Sydney where I somehow managed to squeeze in Les Miserables before I had my transfusion at the hospital. It was a very long day and I’m feeling like a flaccid balloon lying flopped on the sand. I’m spent. It usually takes me a few days to bounce back from these treatments. So you’ll just have to put up with my photo of a line of sand drawn onto a boring piece of computer paper instead. You’ll have to apply your own imagination today. 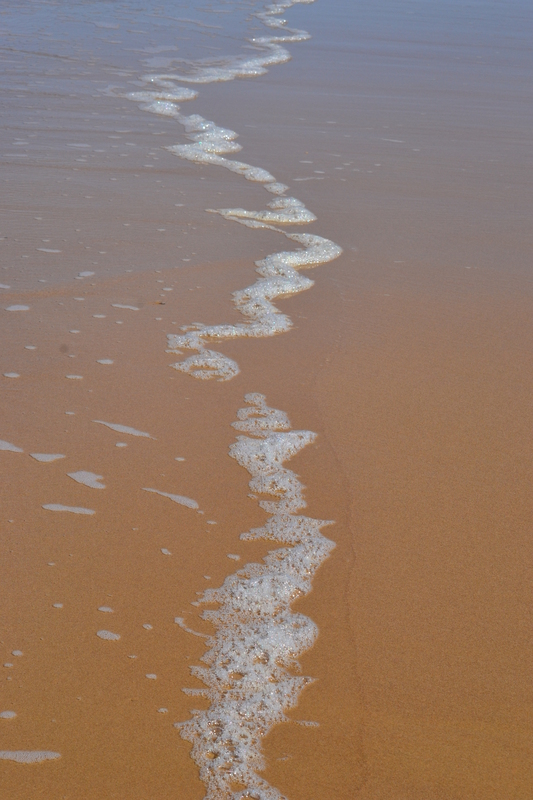 Have you ever thought about what it actually means to draw a line in the sand? Yes, I know it means making a permanent change in your life, a turning point. However, it now seems strangely ironic referring to a permanent change in your life as “a line in the sand”. I mean, poetically speaking, the beach usually represents fleeting transience where dreams, like sandcastles, are washed away even before they’ve even been made. We’ve all been there and experienced that heartbreak. Anyway, I have drawn a line in the sand only my line is permanent…etched in sandstone perhaps! I am no longer going to worry about things that don’t need to be worried about. I’m not saying that I’m eliminating fear and worry from my life completely. It’s just a case of no more worrying about things that don’t need to be worried about. You see, yesterday I worked myself up into such a worried frenzy over catching a bus to the local train station, that I realised I need to make some drastic changes. I am tempted to humour you a little and say that I’ve decided to avoid catching the bus but I won’t. I’ll behave. In many ways, yesterday’s stress was self-inflected. My transfusion was at 2.00PM and I had plenty of time to get down to Sydney. I didn’t need to stress. However, I’d decided to squeeze in seeing Les Miserables on the way and I would literally be squeezing it in too. The movie went for 2 hours 38 minutes and when I checked the train time table, that only left me ten minutes to walk from the station to the hospital. I’m a slow walker and there’s a very steep hill right at the hospital which is just great for sick people…especially sick people who are running late! There was also a much bigger problem with squeezing in Les Miserables. I had to leave home at 8.30AM to catch the bus which meant getting the kids to school half an hour early. School starts at 9.00 AM and we have been unofficially late all term. I’ve been sneaking the kids into assembly or even worse, catching up with the class when they go for their run. Although they’re technically late, they haven’t called the roll yet so they’re “on time” by the skin of their teeth. This means they don’t need a late note. The kids don’t seem to mind being late. They can stall and procrastinate as much as they like. I’m the one who is going to get busted by the powers that be somewhere high up in the Education Department if these late notes start mounting up. We don’t need a visit from the inspector at our house! No! No! No! If I was more pragmatic, I would have waited for Les Miserables to come out on DVD. However, I’d decided that I really wanted to see it on the big screen. I don’t get to the movies very often and I very rarely buy a DVD. Moreover, I haven’t watched many of the DVDs I’ve bought. There have been movies which I’ve really wanted to see that have just passed me by because… There usually isn’t a good reason. So this made me really determined to get to Les Miserables…especially as Hugh Jackman used to be the local heartthrob when I was at school and I really wanted to hear him sing (ha!). But like so many things in life, getting to Les Miserables and to my transfusion was going to take military planning and precision. Sadly, I’m no General. Step 1…Getting out of the house. Thank goodness we made it out of the house on time and despite a few last minute protests, I managed to get the kids through the gate with only minutes to spare. Somehow, I managed to turn this simple step into a network drama. 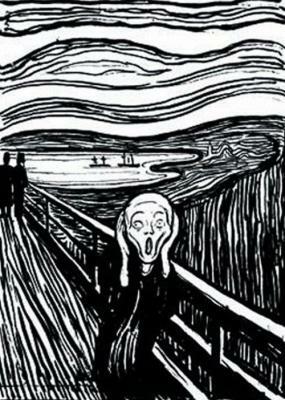 I should have listened to Lao-tzu: A journey of a thousand miles begins with a single step…not with a flapping panic attack! The drama began when I noticed that Bus 53 was already across the road at the bus stop when I pulled up. Yes, I knew it was the wrong bus at the wrong time but there was still this doubt. That “what if”? Instead of sticking to my guns, I started to doubt myself. Doubt the bus. These doubts only got worse when I realised that there were two bus stops across the road from the school and I didn’t know which bus stop was right. My confusion further intensified. Fortunately, there was a time table and yes, bus 70 did stop here. At that point, I should have heaved a sigh of relief but no. When it came to visiting panic stations, today I was travelling all stops. I started to wonder whether my watch was on time. That bus 53 was still bugging me as well. Had I made a mistake? Was I in the wrong spot? Was bus 70 ever going to turn up? Was I going to miss my train and miss the movie? Was this going to be the very end of my life? In case you haven’t realised, I don’t catch buses very often. We’ve been living here for 12 years and I caught my first bus 3 weeks ago so I’m not used to them at all. I much prefer trains. Trains run on tracks. Rightly or probably wrongly, I feel a train has to turn up eventually whereas buses, being more free range, seem more unreliable. Not being on a track, they can do whatever they like and I don’t feel entirely 100% confident that a bus is going to turn up. I know that’s silly, especially when the trains are notoriously late and rails are nowhere near as reliable as they seem! So there I am standing at the bus stop. I’m not jumping up and down on the spot or anything else that would betray my inner frenzy but by this stage all this worry was going round and round in my head like a Greek dance. You know how the music starts out soft and slow at first but speeds up getting faster and faster until it reaches fever pitch and the music is flying! Really flying! I was caught up in a frenzied vortex of pure fear…all about waiting for a stupid bus which wasn’t even late! Of course, I forgot to breathe deeply. I also forgot all my relaxation visualisations like picturing a smooth calm lake. All I could see was a drowning woman. A woman drowning in waves of utter panic. That woman was me. My goodness…all this stress over a stupid bus! A bus that isn’t even running late…yet! Then, I spot a plover across the road. It steps off the curb and plants itself in the middle of the road and it’s strutting its stuff defending its turf….no doubt against any passing cars and of course, my bus! The plover looked absolutely ridiculous. It was taking on a battle it simply couldn’t win. I mean a plover versus a bus…it’s a bit of a no brainer! Just in case you haven’t encountered a plover, these territorial birds are a bunch of thugs which have invaded our school playground. They’re vicious, mean and nasty and they have poisonous spurs in their wing tips. To be fair, however, the kids persistently chase the poor birds so it’s hardly surprising they’re hostile. It’s war! Yet, there I was waging my own war which was equally ridiculous. Had I missed the bus? Was I waiting at the right stop? Would the bus pull up on time? Would the bus arrive at all? It was madness. As I stared at the plover taking on its invisible foe, I saw myself in the mirror especially when the bus turned the corner right on time and pulled up at my stop. I climbed on board without incident. Nothing blew up or went terribly wrong. The bus also stopped at the other bus stop further down the street and it even arrived on time at the station with minutes to spare before my train pulled in. I had been through all that self-induced stress for absolutely no reason…no reason at all! At that point, I drew a metaphysical line in the sand and decided that in future my worries had to be real. That I wasn’t going to allow myself to worry about non-worries ever again!! You might recall my story about the bird which became trapped in my house and how it reduced me to a quivering, shaking lump of jelly. I thought I’d moved forward on the fear front since then and that I’ve been doing really, really well. I’ve driven to Morpeth. I’ve even driven over the Sydney Harbour Bridge. I can’t help thinking it’s a bit crazy that this whole situation of waiting for a simple bus brought me down. I’d have no trouble playing my violin or even singing in public. It’s not like I’m afraid of my own shadow or even that I’m afraid of all the usual things that freak people out. I’m not even bothered by spiders. For some reason, it’s perfectly okay and socially acceptable to have a crippling phobia of spiders but it’s not so cool to be afraid of missing the bus. This is going to be an interesting journey of discovery. How do I distinguish between a real worry and a fake worry? What steps am I going to take when I encounter a fake worry to ensure I don’t take it onboard and catastrophise over a total non-event? Actually, I do know a few things like practicing my deep breathing and doing my relaxation visualisations. I can also watch my self-talk and try to nip the anxiety spiral in the bud. I could also ask myself whether this is a life and death situation. What is the worst that would happen, for example, if I had missed my bus? Not much! I could have driven myself to the station and I might have even found a parking spot. I could also have asked just about anyone from the school for a lift. Most people would have been happy to help. I might have missed out on the movie but I would still have had plenty of time to get to the hospital. Missing out on Les Mis would have been a disappointment but it was hardly a matter of life and death. Yes, I actually managed to see Les Miserables on the big screen. I loved the movie but it was very, very sad in parts. I particularly enjoyed Ann Hathaway’s performance as Fantine and Hugh Jackman was great. Russell Crowe’s character was so despicable that I can’t really look favourably on Crowe’s acting ability. I managed to buy myself a pie en route to the station. This wasn’t just any ordinary pie but for all the wrong reasons. Step 4. Catch the train from Hornsby to St Leonards. This is where the real life and death stuff actually took place. I was eating my meat pie on the train when I started to choke. I’m not just talking about a little choke either. I think I’d inhaled some of the pie into my lungs and due to my muscle weakness, I was having trouble clearing it out. I was barking and barking trying to clear my chest and nothing was working. I was coughing and coughing and coughing. I had a bottle of water in my bag…a standard inclusion for long trips. The water probably helped but I was in real trouble this time. The coughing just wouldn’t stop and we’d gone through several stations. I think we’re talking about something like 10 minutes of solid choking by this point. Anyway, there I am on the train. It is early afternoon so the carriage is almost empty. I am sitting on my own so I couldn’t just reach out to someone easily to get some help. In many ways, I was trapped inside myself, which would have been quite awful if this sort of thing hadn’t happened to me before. I haven’t choked quite this badly in the past but I wasn’t really worried. I just wanted the coughing to stop. I’m still coughing. I feel like I’m going to be sick, possibly the only way to dislodge this thing. At the same time, my nose is starting to run in sympathy and the situation is desperate. You know how it is when your nose screams out. It demands immediate relief! So there I am coughing my lungs out and trying to hold my nose in while the girl sitting in front of me is applying her mascara. I can see her peering at her eyelashes in a little hand mirror. She doesn’t seem perturbed by my coughing at all. She doesn’t flinch and certainly doesn’t turn around. Now, I could make a bit of a judgement call and say that she doesn’t have much of a social conscience and certainly doesn’t apply the Golden Rule (or even the Inverse Golden Rule). I could also make some comment about how you could die on a train in Sydney and no one would offer to help you. That might all be very true but I will be more charitable. If you weren’t medically trained or if you didn’t have any experience of choking yourself, would you know what to do or how to respond? It’s only now that I’m writing about this experience that I have remembered the Heimlich manoeuvre. This is an emergency technique for preventing suffocation when a person’s airway (windpipe) becomes blocked by a piece of food or other object. I haven’t thought about this since Mothers’ Group. When I Googled it both to remember what it was called and the procedure, I found out that you can actually perform the Heimlich manoeuvre on yourself. This was a great discovery which is very empowering for me and also helps to reduce a source of real, very legitimate fear. Knowledge is power and for me this knowledge could save my life. Remember, I have muscle weakness so this is good to know. Anyway, even though I am sharing this story with you from the comfort of home and you already know that I’ve survived, myself the character is still choking on that train and is about to have a serious nasal explosion. So we must return and please bring a tissue along with you. I still need it. Next, I did something truly disgusting. Something which I wouldn’t even confess to one of my closest friends, let alone broadcast to the entire World Wide Web. I blew my nose on the white paper bag which had housed my pie. I will emphasise that the paper bag was clean. It looked like a tissue and it was a much better option than my sleeve. I didn’t have time to get off the train and I just didn’t feel that I could ask anyone on the train for a tissue. I don’t know if that’s a reflection on them or on me. It was just how I felt at the time. I’ve now made a mental note to put a packet of tissues in each of my handbags. This is not the first time I’ve been caught out and it’s time I learned. Another line has been etched in the sand. Somehow, I arrived at my transfusion pretty much on time. All that stress had all been rather superfluous. Superfluous in terms of me getting anywhere on time but not in terms of having detrimental effect on my wellbeing. Stress in itself is a killer. But I’ve now drawn a line in the sand, there is no turning back. 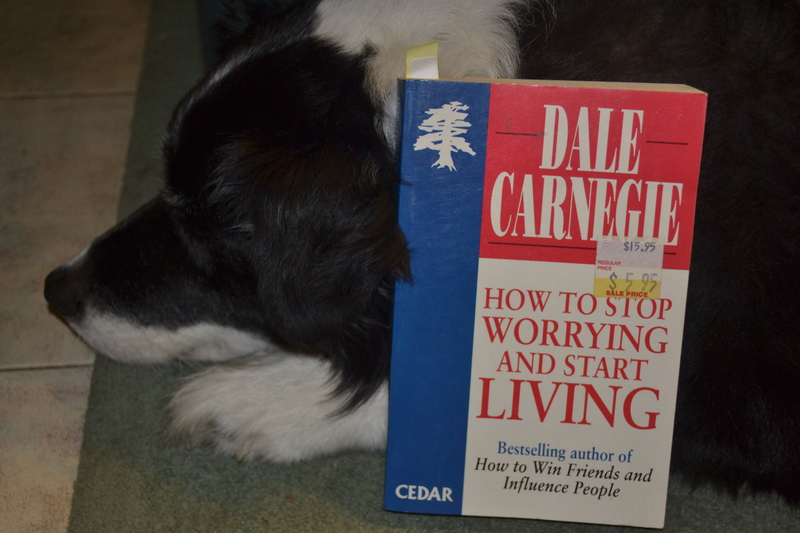 I’ve raided my bookshelf and it’s time to finally read: Susan Jeffers: Feel the Fear and Do It Anyway and Dale Carnegie’s: How to Stop Worrying and Start Living. The Secret to a Happy Dog! 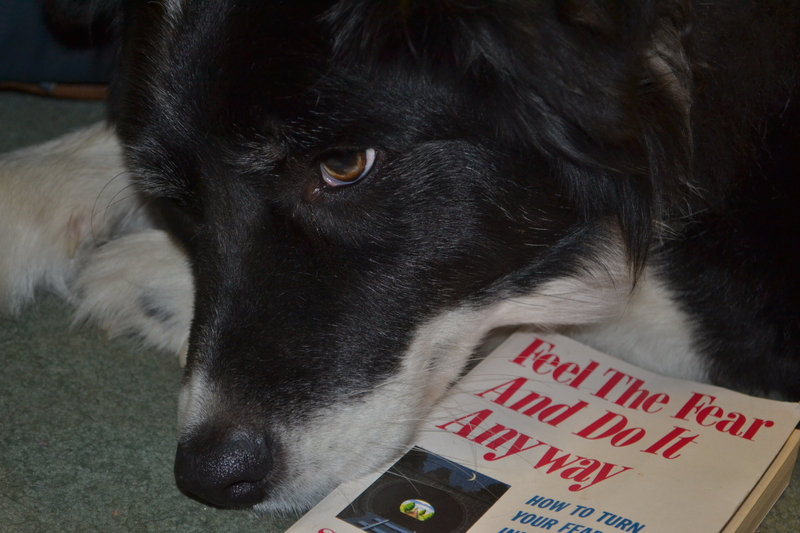 I think the dog must have read these books already. He’s quite a happy dog and he’s had a great day. He went for a drive in the car and had some leftover pizza for dinner. He may not be getting any thinner but he’s happy! He’s a smart dog. He even managed to get it on sale. PS I found this photo on file. Not a bad line in the sand after all. A line in the sand quite different to what I’d envisaged but I like it. This entry was posted in Books, Dog-Our dog Bilbo, Health, Uncategorized and tagged acceptance, adversity, anxiety, auto-immune disease, Change, chronic illness, Dale Carnegie, death, dermatomyositis, driftwood, fear, Gibran, goals, happiness, health, illness, inspiration, Les Miserables, line in the sand, Muscular Dystrophy, panic attack, philosophy, photography, relaxation, The Scream, trains on February 28, 2013 by Rowena. And The High-Five Goes To… Beyond the Flow No 2. And The High-Five Goes To…. Well, I took out second place. Yippee! I am so excited. It could have been the Oscars but I must admit that I’m pleased that I didn’t have to get all frocked up to collect my award. I would recommend checking out the other award winners. I particularly liked http://starwarsanon.wordpress.com/2012/10/17/the-rise-of-the-geek/ which gives a very personal and moving account of being bullied at school for liking Star Wars and such like. The pressure that is put on young people to conform and the consequences for those who don’t. This entry was posted in Uncategorized on February 26, 2013 by Rowena. Love Spawned…Embracing the Great Minecraft Challenge. Love is a seed. For love to keep growing and ultimately survive, you have to keep watering it. That’s the hard part. Keeping up all that boring maintenance…especially long after all the flowers have died and what’s left of the plant should be kept well and truly out of sight until next spring. I don’t know about you but I’m not good with all that long term, routine kind of stuff. As much as I love gardening and all my pretty flowers, I must confess that I’ve had quite a few plants die of thirst right next to a tap and I’ve felt so bad!! You would think that I could make that very small effort to give them a drink, especially when I didn’t even need to go out of my way?!! Yet, sometimes even those small, seemingly painless steps are too much even for the strongest and deepest kinds of love which go way beyond seeds, plants and gardening and involve the very people we love and cherish the most. For me, learning to play Minecraft was about watering these seeds and nurturing our family, knowing full well that it would catapult me right out of my comfort zone and dump me into hostile, crocodile infested waters. Snap! Snap! You’re gone! I have to admit that I was quite terrified of playing Minecraft, especially after my introduction last week. It was nothing like Space Invaders. Nothing like Space Invaders at all! Well, he has a point! When my great Minecraft challenge began, it reminded me of arriving at the dentist knowing I was about to have root canal. I sat in my chair and the iPad was put on my lap. As much as I knew it was going to hurt, I knew the alternative would be far worse (something like tying a piece of string around the offending tooth and slamming the door shut without any form of anaesthetic.) I had to go through with it. Waves of panic completely overwhelmed me. I’d been catapulted so far out of my comfort zone and wanted to boomerang back there again. But writing about doing things with your family is no substitute for spending time together. I just had to do it. Embrace all those horrible, uncomfortable feelings and walk with them hoping that as time went by, I would somehow feel more at home. The trouble with Minecraft is that is involves a number of my weaknesses and while working on these would ultimately help them to improve, getting to that point is hard, frustrating work. It’s like scaling Mt Everest using your bare fingernails and who doesn’t want to avoid that kind of stress? It wasn’t just a matter of learning Minecraft. I didn’t know how to operate the iPad either. Not that it should have been that difficult because it is like my mobile phone. However, trying to learn Minecraft at the same time, seemed to compound my difficulties and the whole thing felt crushingly difficult. I was freaking out. I have no shame. I really am one of those old dogs who doesn’t like new tricks. He was right. I persevered. I embraced the terror and kept going. That said, I did have the timer going. I was going to be playing Minecraft all day!! Firstly, if you keep focusing on your feet, you have no idea where you’re going. A few times, I was wondering why I couldn’t get through a doorway when I was actually bashing my head against a dirt wall. It always helps to see the bigger picture. Secondly, beware of the power of touch. I would be tapping on the screen trying to open or close a door and instead, I accidently dumped a mound of dirt in my tracks. I also accidently bashed a few holes in the wall with my wooden pick axe. Such acts of wanton vandalism aren’t usually appreciated by the other players. Thirdly, despite being in a virtual world, you are still “you”. With my poor sense of direction and spatial reasoning, I get hopelessly lost in real life and the same applied in Minecraft and it felt just as awful. I was constantly lost, which felt really, really unnerving. Nobody likes getting lost even if it is just “a game”. A few times I wondered what on earth I was doing in my lost state and Geoff would call out: “where are you?” I was so lost that I’d somehow become “beyond lost”. “They say to find a missing bushwalker you first have to try to think like one. “We try to get in to the psychology and understanding what common mistakes people would make while they are walking. People do unusual things when they are lost,” said rescuer Caro Ryan. Geoff must have picked up on this because it didn’t take long for him to suggest: “Follow me!” It was as close as he could get on Minecraft to actually holding my hand. He was protectively and encouragingly lead me not only through the house we’d built but also though the minefield which had become Minecraft. There was so much to learn. I had to follow him very, very closely and he really looked out for me too which was nice. I also learned that the kids don’t close doors in Minecraft just like in the real world. 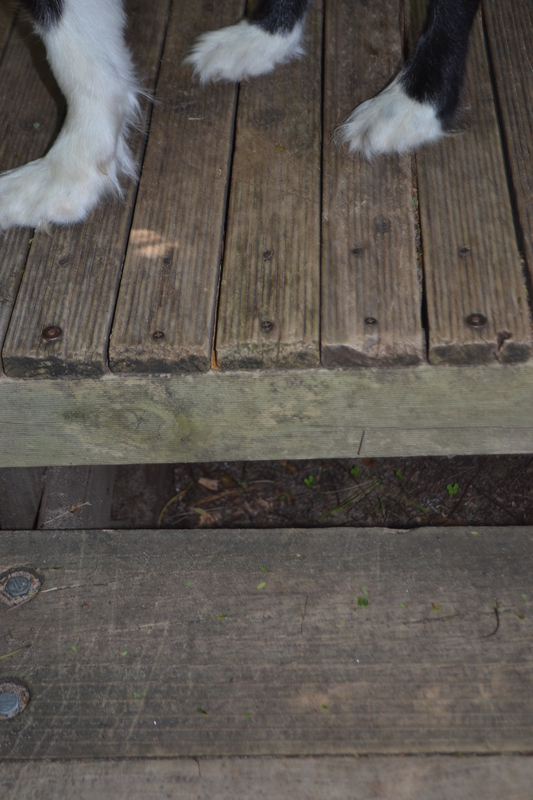 In real life, they let the dog out and in Minecraft, they let the creepers in. Grr! Yet, probably what I appreciated most is what it actually takes to get someone you love to take on your interest to a point where they can truly understand and enjoy it, join in and want to do it again. You need to put yourself in their shoes and somehow walk at their pace even if it might be excruciatingly slow to the point of irritation. You might need to steps down into bite-sized chunks or even micro-bites so they can pick it up and feel they can do it. You want them to feel good about what they’re doing! When I was lost and Miss took me off on a wild goose chase leaving me vulnerable to the creepers, Geoff firmly explained to her that if you want Mummy to play again, you want her to have a good experience. Enjoy it and want to come back. Another thing I found interesting was juggling the balance between caution and risk. In Minecraft, you need to build defences to protect yourself from the creepers but you also want to actually do some stuff. The first time I played, I found myself a nice deep tunnel and stayed inside. I was surrounded by stone walls on almost all sides and I was very safe but I was doing nothing. I was just sitting there in the dark waiting for the sun to rise. With all that waiting, the iPod went to sleep and disconnected from the server. This meant I’d lost all my tools etc and had to start over. Being so safe was also pretty boring. It was like when you’ve found a really good hiding spot in Hide & Seek that you’re still hiding there when everyone else has moved onto the next round. It gets a bit boring after awhile. Beign so safe was pretty boring and I did start wondering whether it would be more fun outside chasing creepers instead…even if I died! Besides, you don’t actually die in Minecraft. You respawn but you come back with nothing and have to start over. Lastly, I don’t really see the excitement in doing all these virtual jobs on Minecraft. Even virtual jobs feel like too much hard work. Moreover, if Geoff and the kids enjoy all those jobs so much, they should get started on the house but I guess real work doesn’t quite have the same appeal. I don’t think they’ll ever make a gamer out of me but at least I’m having a go. I’m watering the seeds. You never quite know what is waiting around the corner and when those few minutes of my time might actually make the difference. The Sydney Morning Herald, February 23-24, 2013 pg 11. This entry was posted in Love, Parenting, Uncategorized and tagged computer, computer games, fear, inspiration, kids, love, maintenance, minecraft, mom, motherhood, motivation, mum, parenting, seed, technophobe on February 25, 2013 by Rowena. 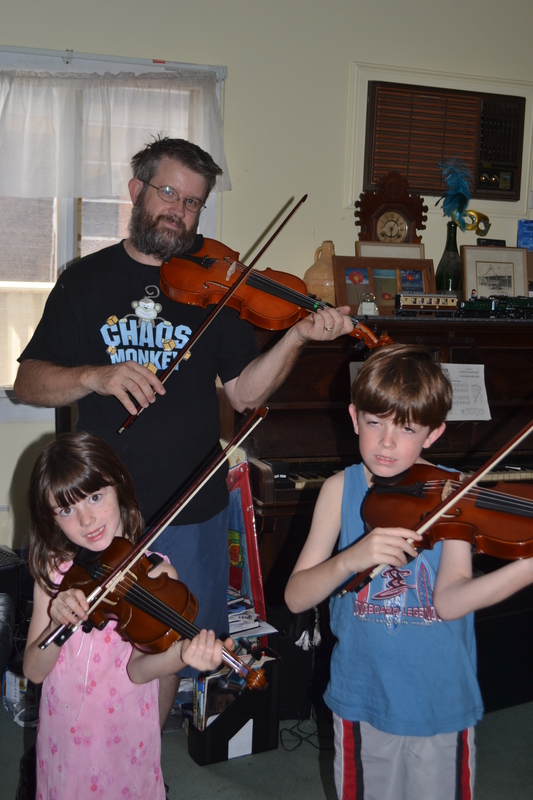 This morning our family, all four of us, played the violin together for the very first time. It was an incredible experience. Not because we were any good. We weren’t but that wasn’t the point. The important thing was that we were doing it together. While I had carefully prepared the soil, we were all planting the golden seed. I have to admit that this seed didn’t come nicely labelled in a packet so we have no idea what it might grow into. Yet, we’ve planted it in good soil with plenty of sunshine and must remember to water it. Even the most robust seeds need a bit of TLC to thrive. While I have no idea what this tiny seed will become, I’m sure that it’s the start of something beautiful that could take an entire lifetime to grow. It might have nothing to do with the violin but that seed will know what it means to be nurtured, loved and given the best opportunity to reach its awesome potential. Isn’t that all that really matters in the end?!! 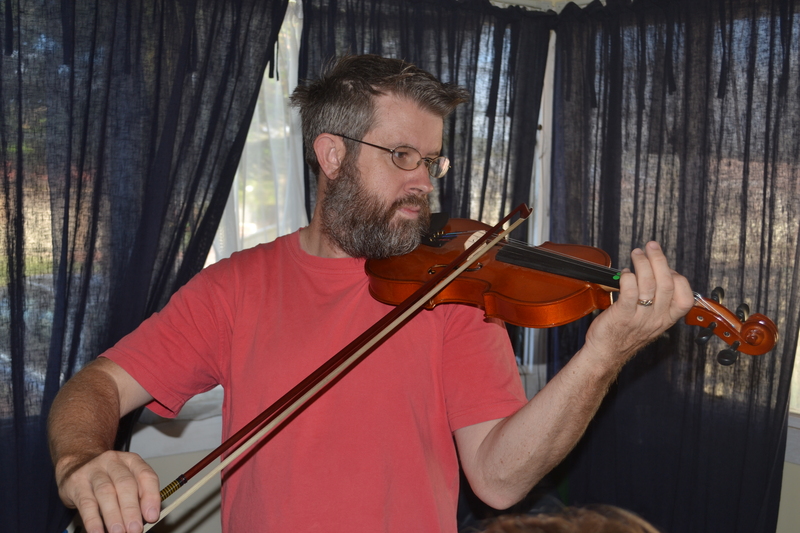 This morning was also Geoff and Mister’s first real official violin lesson. You see, Miss and I play the violin together while Geoff and Mister play the guitar. Mister has been learning the guitar for about a year. He is steadily improving and can now play Just the Way You Are by Bruno Mars. Last year, he actually won the Junior Enthusiasm Award at the music school. He’s slowly but steadily improving and is now starting to have a bit of fun. The other night, he said: “I was born to play guitar.” That might be a fleeting thing but it was great to see him so happy!! He had found himself…at least for the moment. While the guitar might be his instrument, he has also expressed a keen interest in my violin, which is hardly surprising given my own unbridled enthusiasm. I practice for at least an hour most days and I now think and breathe the violin along with writing, of course! He has seen me start out as a scratchy beginner and improve and has been very encouraging throughout this process. 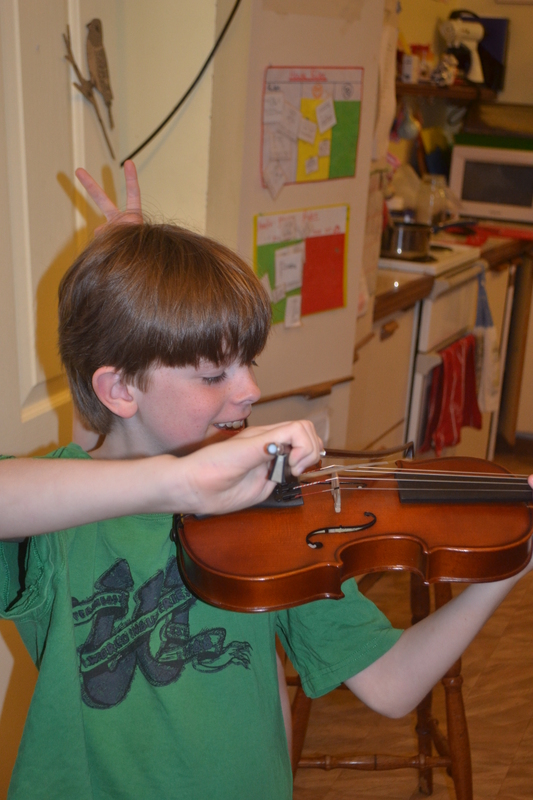 He has also picked up my violin and had a go himself. Impressively, it didn’t squeak and seemed to like him, which is quite unusual for a violin. They can be very anti-social at times! 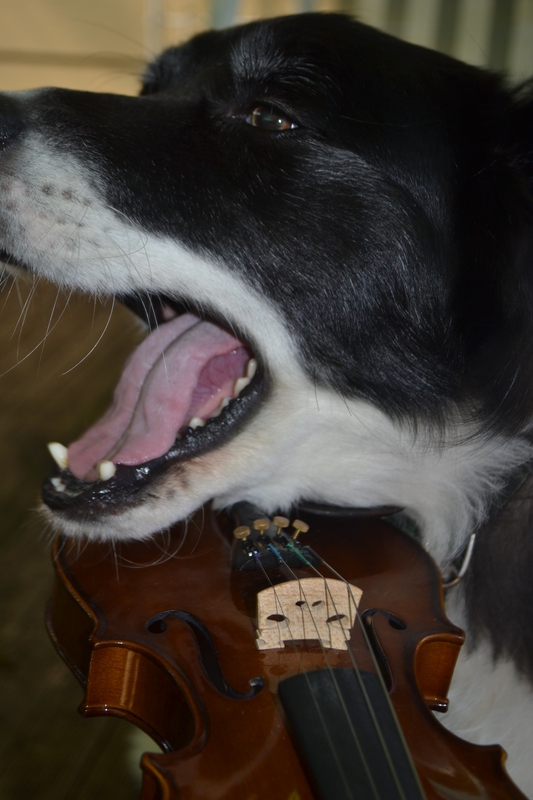 It’s been quite difficult to know quite how to respond to Mister’s interest in the violin. 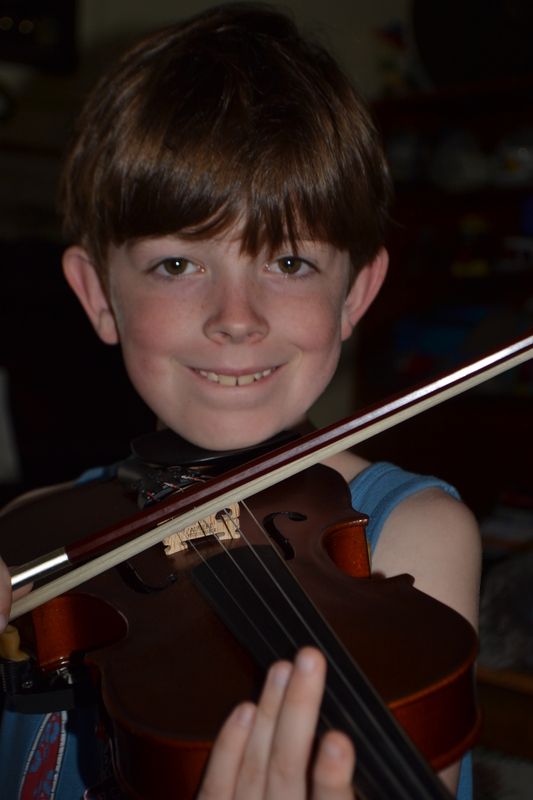 Whether to encourage it by buying him a violin and giving him a few simple lessons myself or whether to keep him firmly focused on his guitar at this early stage. Learning the guitar is hard enough and the violin is known for being a notoriously difficult instrument. Naturally, I didn’t want him to fail. 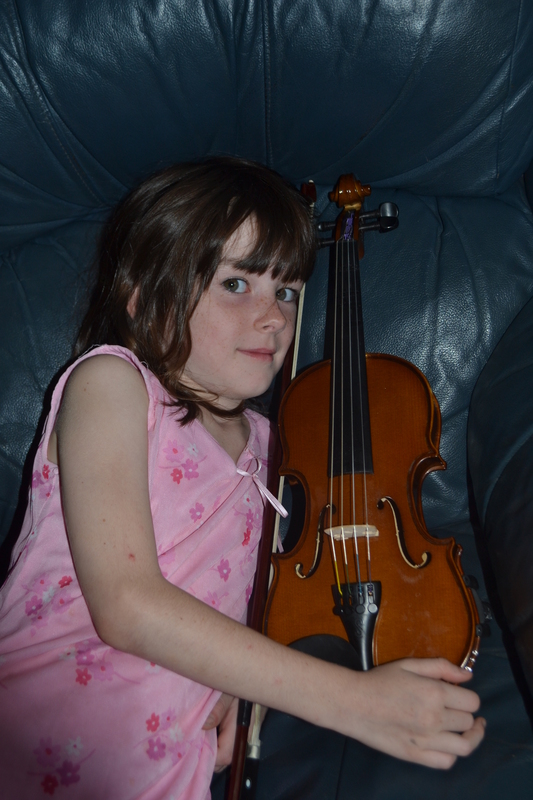 Miss cuddling her new violin. I’d found someone selling two Stentor II violins on Ebay. At the same time, I sensed Mister was feeling a bit left out. 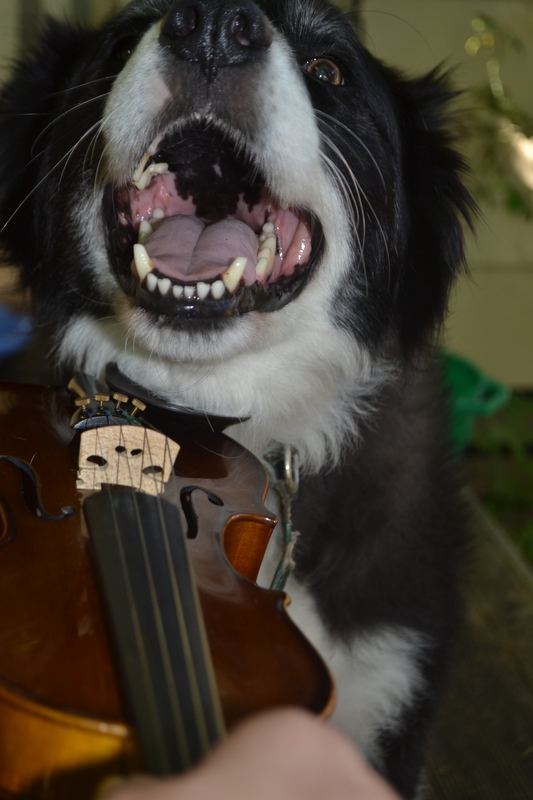 While he practices his guitar with his Dad, Geoff often gets home too late from work, which has left Mister to practice on his own while Miss and I play our violins together. He could see how much I love the violin and that I was sharing my passion with his sister and he wasn’t a part of that. Sure, we have listened to him play his guitar and have even danced along but it wasn’t the same. I wanted him to feel more included but I didn’t want to overwhelm him either. Some might describe me as a pushy, ambitious mother trying to fulfil my own failed dreams through my kids. I certainly encourage the kids with their music but playing the violin was never my dream. It wasn’t even on my radar. Rather, it was my daughter’s dream and somehow the violin chose me. I had no intention whatsoever of even learning an instrument or doing anything vaguely musical. I wasn’t into music and didn’t even listen to music unless I was driving. Writing is my thing and I prefer to write in complete silence so music and I were pretty much incompatible. Or so I thought. 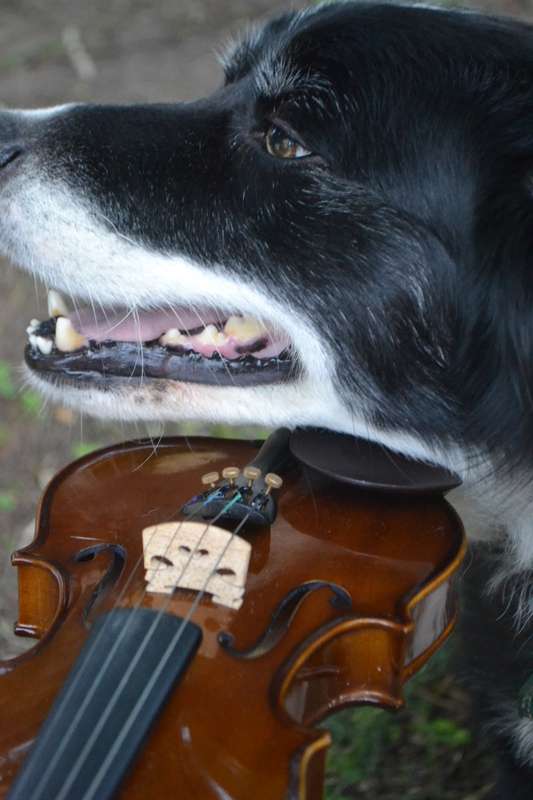 In the end, as crazy as it seemed, I asked Mister if he would like his own violin. He was really excited about it, especially when I was bidding on ebay and those final minutes were counting down. He really wanted his own violin and couldn’t wait to play it!! Well, the violin arrived yesterday and we decided to have a “jam”. As we all know, doing things as a family can be fraught with disaster as all our best intentions crumble into an all out brawl. Violins can also be very badly behaved. Moreover, I don’t know anyone who has successfully taught their own children a musical instrument and everyone tells you never to learn an instrument from your partner or spouse. It’s doomed to fail just like learning to drive! So who do I think I am? What makes me think I can succeed where others with so much more experience have failed? Yes, I know I’m a dreamer but sometimes your dreams can actually come true and for us, even for this brief moment in time, the impossible happened. The four of us played the violin almost together and it was a truly beautiful thing. I’m not quite sure whether you’d call our experience an adventure, an experiment or simply having a go. It’s too early to tell but it was good. The biggest problem was trying to fit us all in the lounge room. Bowing takes up quite a lot of space. I went through the names of all of the strings and how to hold the violin and then we got started on a very basic tune. Mister’s violin doesn’t have the dots on it so we were limited to the open strings. That was good because we all need to learn in small, manageable steps, even when we’re trying to catch up to our little sister! He played well without any screeches or playing two strings at the same time, although his bow did stray diagonally across the strings and he was struggling to work out where to put his chin. 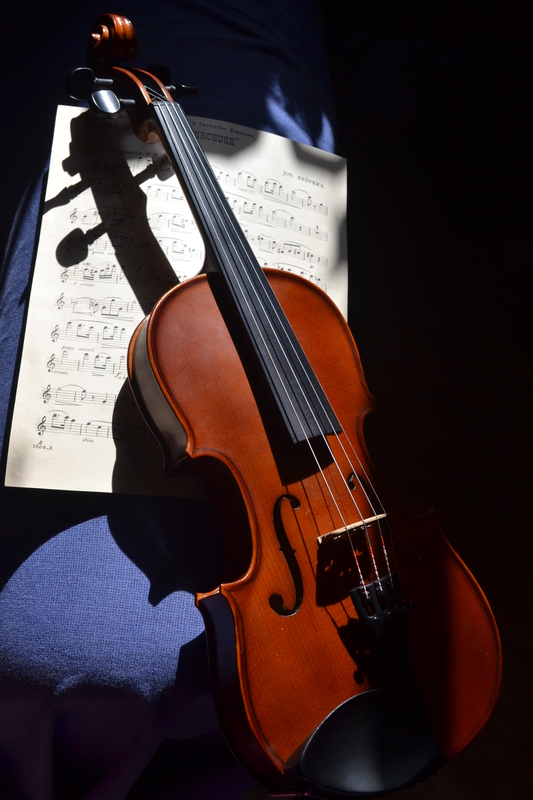 With the violin, you not only have to struggle to produce a decent sound, you also have to learn how to stand, how hold your violin, where to put your fingers and how to hold your bow. Nevertheless, Mister was concentrating deeply and I could see the violin was speaking to him. I was just intrigued about what it was saying. Meanwhile, Geoff was starting to play Silent Night by ear on his first lesson. He seems to be a very promising pupil! By the way, Geoff and the kids gave me my first Minecraft lesson on the iPad after our violin lesson. That’s an entirely different language but I’m giving it a go. I can’t help wondering where this journey will take us. It certainly feels like we have chosen Robert Frost’s The Road not Taken and so far the risks have paid off. It will be interesting to see what will become of this seed and how this journey will make a difference. Actually, I suspect that it already has. Our little family quartet is steadily improving after what’s now been 4 family practice sessions. We are now getting started on Suzuki Book 1 and playing Twinkle Twinkle Little Star Variations. I know this is just the very beginning but to pull this off, well to be honest almost pull it off as a family, is beyond my wildest dreams. It encourages me to believe that almost anything is possible. Mister says he’s enjoying playing two instruments. The dog even hung around for today’s performance. We must be sounding better! Mister smiling during practice tonight. He was really enjoying himself. 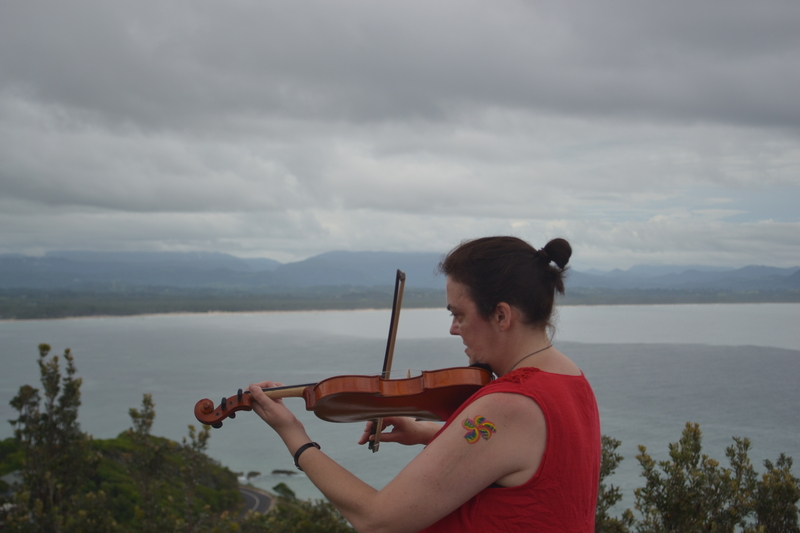 This entry was posted in Love, Parenting, Uncategorized, Violin and tagged family, growth, guitar, learning, love, motherhood, motivation, mum, music, musical instrument, parenting, personal development, seed, violin on February 18, 2013 by Rowena.